When life throw you lemons, you make lemon cream cake with them. This is the most divine cake I have ever had. It is creamy, lemony and perfectly satisfying. It tastes like lemon cheesecake except it is without cheese and it is light and fluffy like clouds in the sky on a blue summer sky. A bite of this cake makes you feel like you’re skipping barefooted through a field of flowers with lemon trees all around you…in a dreamy kind of way. Well, I didn’t invent it entirely…Believe it or not, this cake was modified from Laura Calder’s Chocolate Cream Cake, which is equally divine I’m sure. It was quite the gamble modifying this recipe into a lemon version but I figured it wouldn’t hurt. It only hurt when P got the last piece! 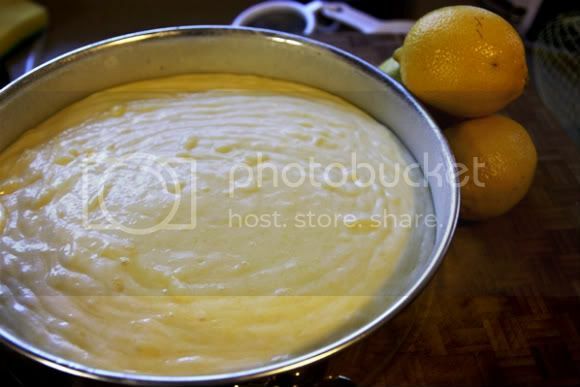 My friend Kwok Mun and I made some lemon curd while I visited him in Chicago, so refer to his blog for some delectable pictures. Lemon curd is great as spreads too! Heat the oven to 350F and grease a 10-inch cake pan. Prepare a large tray big enough to place the cake pan because you will be adding hot water into the tray while the cake bakes. Create a bain-marie by putting a large steel mixing bowl on top of a simmering pot of water. In the mixing bowl, add the 6 eggs, sugar and vanilla extract. Whisk the mixture on the bain-marie until it tripled in volume. This will be a constant mixing of approximately 10 minutes. If you have an electric hand mixer, count yourself lucky – I whisked this by hand! On different bowls, whisk the heavy cream until stiff peaks form and mix the flour mixture in with the lemon curd until well combined. Now you technically have three products ready to be assembled; i) Lemon Curd ii) egg mixture that’s tripled in volume 3) whipped heavy cream. 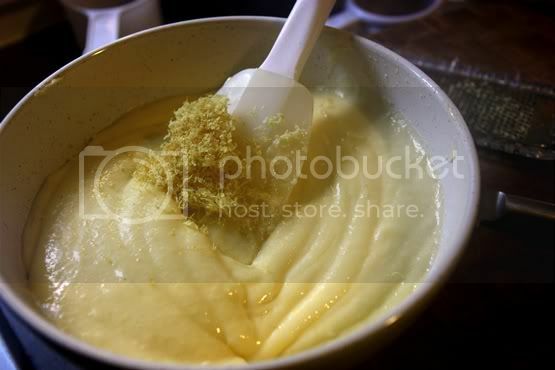 To assemble, pour about 1/4 of the egg mixture in the lemon curd and mix it well to temper. Then pour the lemon curd into the egg mixture and gently fold it until it’s semi combined (the mixture looks streaky). Then, at this point add the whipped cream in. Gently fold the mixture until it is evenly combined. Pour the cake mixture into the cake pan and place the cake pan into a large tray. 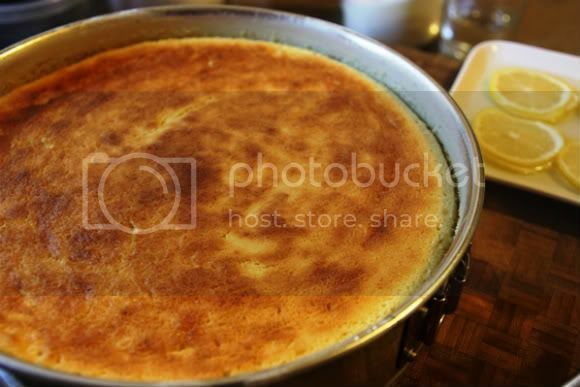 Add hot water into the tray until it is comes up to the middle of the cake pan. Bake for 1 hour or until the skewer comes out clean. Let the cake cool completely before serving. And don’t forget to dust some icing sugar over the top! I adore lemon desserts, and this cake has me drooling. 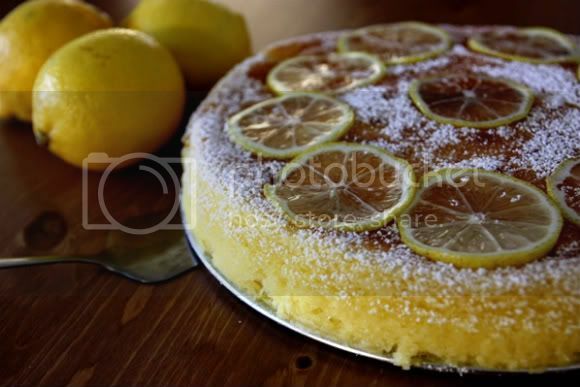 I love the candied lemon slices on it; looks as gorgeous as it sounds! Ooo … if only this came earlier. A month ago, I could have gotten a crate of lemons for $10 but didn't know what to do with it except for making lemonade. This is nevertheless a good recipe. I still need to make your blueberry cheesecake. Looks so good! Beautiful! I love lemon curd, and am glad to have found another recipe I can slip it in! mykitchenfromscratch: Kwoky, not only lemonade but also lemon curd! MMMMMM! I love the lemon slices on top of the cake, creative. I love your blog, and the cake looks wonderful. I think I'll have to try it!